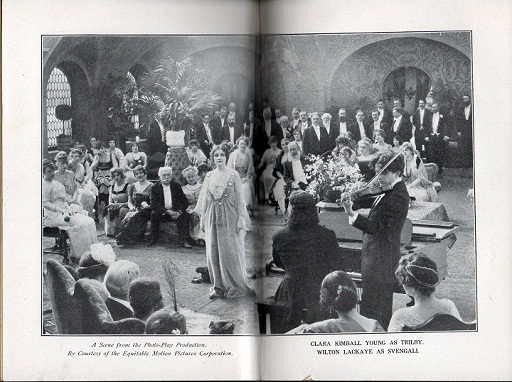 A recent email from AbeBooks highlighted “photoplay” books, editions that were published in conjunction with the release of movies based on best-sellers from the 1910s into the 1940s. 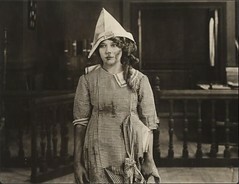 Some were novels adapted into movies and some were really movie screeplays that were adapted into books (and back in the 1910s, when “photoplay” was the preferred term over the slangy “movie,” this latter formula was typical). 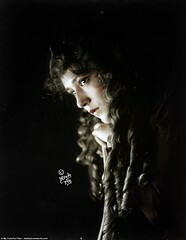 These were, of course, promotions for the films, but they also added to the profits of publishers and authors as well, giving added life to books published several years or more before the film adaptation was released. Generally, there was nothing particularly special about the books themselves — the bindings were usually a pedestrian cloth with minimal, if any, artwork. You won’t see editions with elaborate gold trim, hand-laid paper, moire silk endpapers, beautiful plates or silk ribbon markers. They almost always included at least a couple of pages devoted to illustrations, usually studio PR photos, of scenes from the film, and cast credits. What made them special, then and now? If you haven’t guessed it already, you are not a collector of 20th century books (though, technically, neither am I). The DUST JACKETS! What the photoplay edition bindings and text blocks lack in visual appeal, the dust jackets make up for in spades, with illustrations often in blazing color, artwork that resembles the gaudy posters and lobby cards promoting the movies. As you might expect, there is a strong correlation with the value of the book and the condition of the dust jacket. Very Good to Fine are obviously the most desirable. However please beware that, as a general rule, dust jacket condition “ratings” are even more variable and subjective than those for the book itself — scan the listings at any book listing service, and you’ll find this out yourself. But study before you buy. “Very Good” might still mean a jacket that has small tears and chips and fading on the spine. Most book sellers who list on sites like AbeBooks who don’t display images of their books will email photos upon request. Value also has a correlation with other movie-related memorabilia, particularly the posters. Which means, of course, that horror movies of the early 1930s, especially the Universal releases, tend to bring the highest prices in photoplay book editions, as they do in the posters and lobby cards issued to promote the films. Naturally you can expect to see prices in excess of four figures for Frankenstein, Dracula, King Kong, and their brethren. That doesn’t mean you can’t run across bargains. The public fever for the majority of photoplay books isn’t (and hopefully will never be) even close to that of the wacky world of movie posters. And if you are willing to accept a specimen that is less than perfect, they might even be affordable. But those of us with modest means might still have to avoid photoplay editions of the creature features. See what I mean? Great jacket, bare-bones binding (it does include some great two-tone photos on the end papers). This is a prime example of a photoplay edition that is actually a “novelization” of a movie, a concept that probably originated in an alternate universe where movies existed before books. A relative bargain at under $700US (others list for ten times that amount). 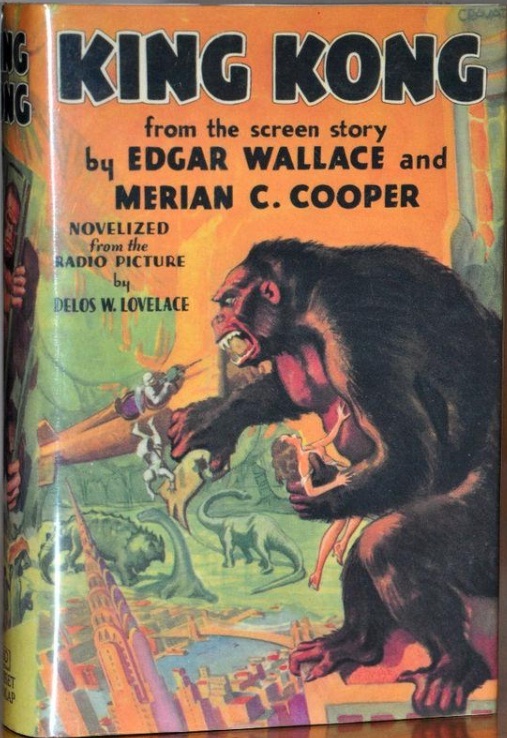 King Kong, Grosset and Dunlap, 1932, Photoplay first edition, book condition Very Good, dust jacket Near Fine ($699.95US, at AbeBooks. Other Kong photoplays are also listed, in a range of $395 to $7,995). At near right, A 1932 photoplay first edition of the racy 1931 novel by Katharine Brush that Anita Loos adapted for the MGM film that embarrassed Louis B. Mayer and Irving Thalberg, and lead to the enforcement of strict censorship of Ameican movies for the next thirty years. On the left, not a photoplay 1932 first edition, but a later Grosset and Dunlap reissue without illustrations, it uses the same artwork featuring a fire-engine-red-headed Jean Harlow on the dust jacket at a fraction of the price (but “cheap” is relative, at $85 versus $650 for a photoplay first edition, both listed on AbeBooks). But still very rare. 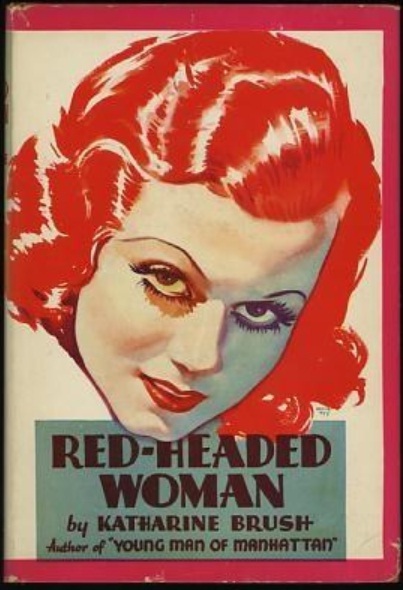 Katharine Brush, Red-Headed Woman, Grosset and Dunlap, 1942, Near Fine condition, dust jacket Very Good+, $85; Katharine Brush, Red-Headed Woman, first photoplay edition, Grosset and Dunlap, 1932, Near Fine, dust jacket Fine, $650, both books listed at AbeBooks. 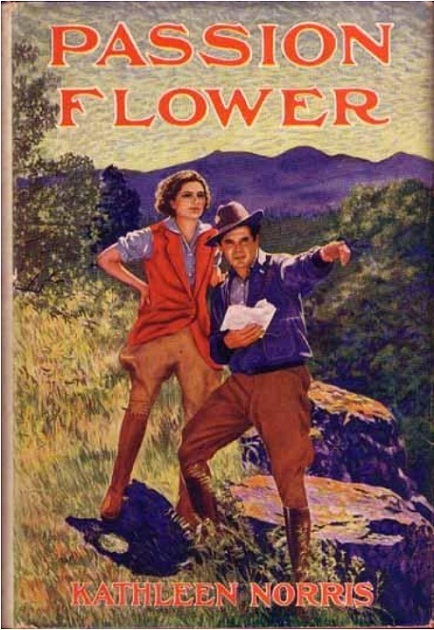 Also not a photoplay edition, technically not even a tie-in with the 1939 film starring Kay Francis, based on this 1935 novel by Francis Walton. 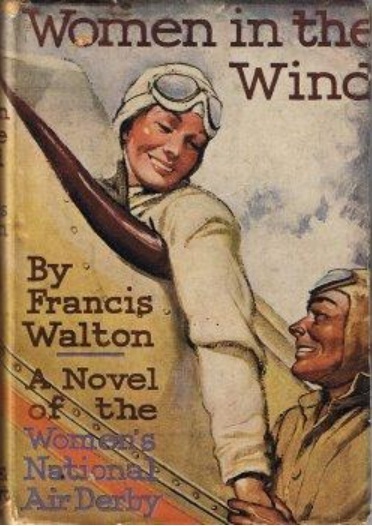 This is a first edition of a book that was a best-seller during the female aviation craze of the 1930s that culminated in the loss of Amelia Earhart in 1937. Kay Francis was not an aviatrix, but her close friend Ruth Chatterton was, and it was a subject that interested her. 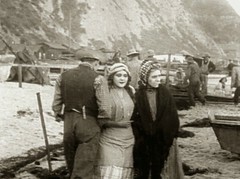 Not one of Kay’s best films, it was the film that completed her contract with Warner Brothers. At least Francis got to pick the screenplay for her last WB epic, one that, unlike King of the Underworld, she could play without embarrassment. Francis Walton, Women in the Wind, Farrar and Rinehart, 1935, first edition, Very Good+ condition, dust jacket Very Good, $500, on AbeBooks. Not cheap, but try finding another copy of this volume with a dust jacket. This is one of only two I’ve seen in the last five years (it may even be the same book — I saw the last one on Ebay for around the same price). Is it safe to say that any resemblance between the female pilot on the dust jacket and Kay Francis is coincidental? 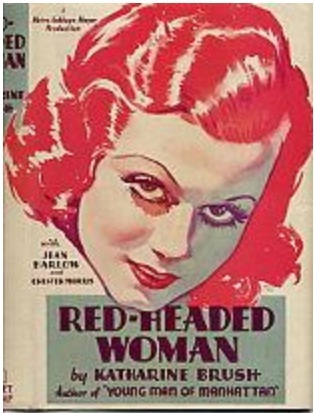 OR did the author and/or her publisher have a movie deal and a particular star in mind back in 1935? Could be. It isn’t often that a great work of literature makes the leap to another art form with a result that is at least the equal of the source. But the novel McTeague by Frank Norris, an author in the vanguard of American Realism in the 1890s and early 1900s, was perfect material for another master of brutal realism, Erich von Stroheim. The final result was not what Stroheim envisioned. His concept was to film the novel — literally page by page. His first cut of the footage that he and cinematographers Ben Reynolds and William Daniels shot was a film in excess of 40,000 feet, running 11+ hours. The final “mutilated remains” as he called it, became “Greed.” In its shriveled form, it may have smelled of death to Stroheim, but it is a motion picture as powerful as anything the art form has produced in a hundred and twenty years. 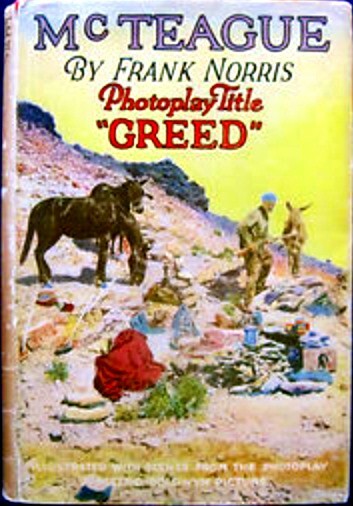 The Photoplay McTeague/Greed is one of those cases where the movie edition with intact dust jacket can often be found for a good deal less than a first edition of the original work. 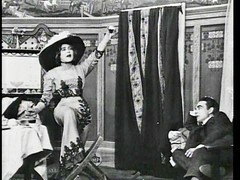 Six copies of the Photoplay first edition are listed on AbeBooks ranging from $75 to $450, the cheapest being the only one without a dust jacket. Two are currently listed on Ebay, one for $385 — the one pictured above — and another (without dust jacket) is currently asking $1,625. Go figure. 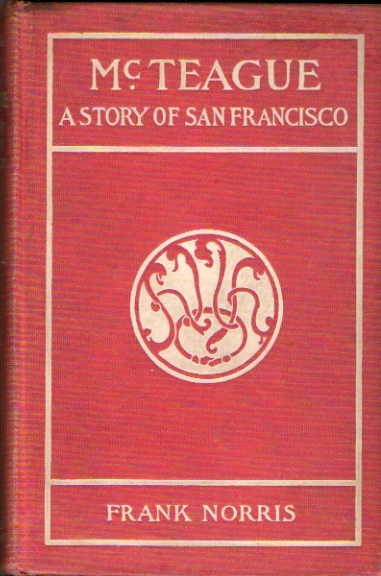 By contrast, a first edition, first printing, first issue, of the 1899 Doubleday & McClure McTeague (no dust jacket issued) in good or better condition ranges from around $250 to more than $1,500. My 1899 first edition, second printing (at right), is one of the highlights of my modest collection. 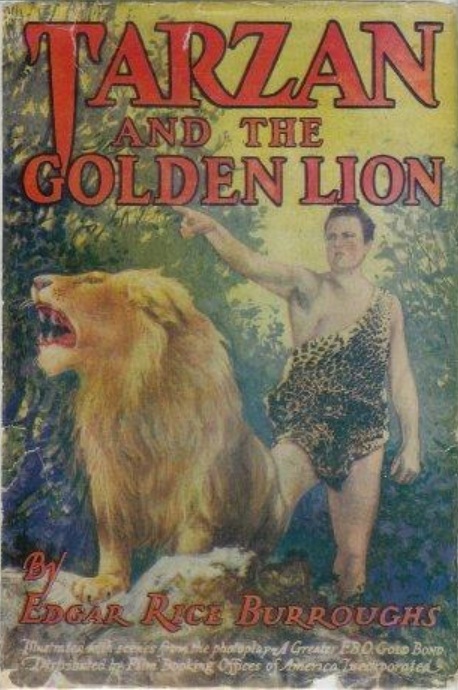 Tarzan and the Golden Lion was a photoplay edition from 1927, but the original film Tarzan, Tarzan of the Apes (1918), starring the estimable Elmo Lincoln as Tarzan, and based upon the first Tarzan book by Burroughs (1914), was not given a photoplay edition tie-in. 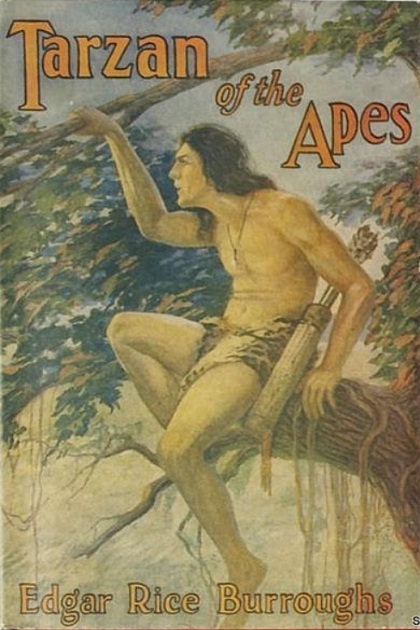 Some of the most spectacular dust jacket artwork in publishing history was on display in the Tarzan series between 1914 and 1949. (Check out the examples at AbeBooks.) On the left, Edgar Rice Burroughs, Tarzan and the Golden Lion, Second photoplay edition, Grosset and Dunlap, 1929, In Good condition with Fair dust jacket ($150, AbeBooks); at right, Edgar Rice Burroughs, Tarzan of the Apes, later reprint edition, Grosset and Dunlap, 1927, Fine condition with Very Good dust jacket ($750, AbeBooks). My only copy of a photoplay edition is the 1915 Grosset and Dunlap edition of George DuMaurier’s 1890s bestseller Trilby, the tale of a young woman hypnotically seduced by the original Svengali. 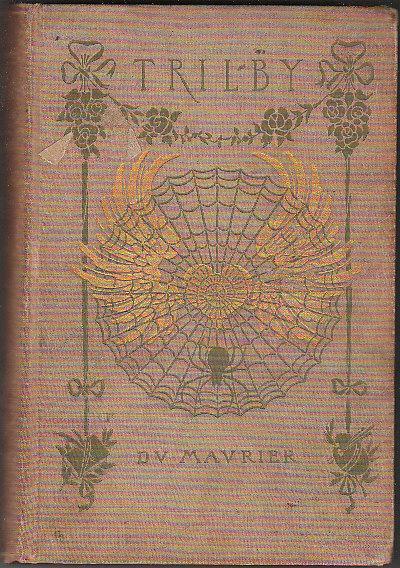 In many respects the original novel impacted the American book publishing industry almost as much as cheap wood pulp paper did in the 1860s and “department store” editions did in the 1870s and 80s. It sold millions of copies at a time when the population of the U. S. was less than a third of what it is now. At left, a “Very Good” first edition of the original 1894 novel, Trilby by George DuMaurier (I paid $15 three years ago), and at right a typical copy of the same edition in “Good” condition for under $10. 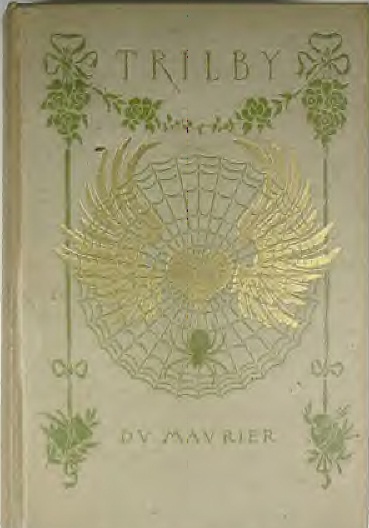 Harper Brothers printed millions of copies in 1894. 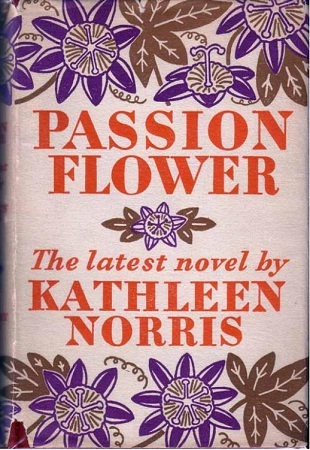 Though the original design was as beautiful as anything published for the mass market up to that time, the book was issued in pale, off-white cloth and given a flimsy binding. The result was slanted spines, warped text blocks and dark, ugly, soiled covers that only got worse with age. Most copies are no better than what I would consider “Fair” condition, but booksellers tend to be especially creative when rating their copies of Trilby. The upside is that there are a lot of copies still in existence, and you can get an American first edition by Harper Brothers for less than $20 in actual Good to Very Good condition (no dust jackets were issued). 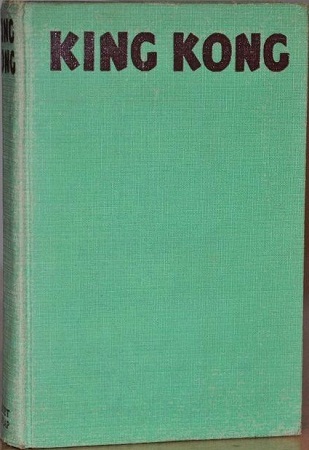 By contrast, the photoplay edition published in 1915 by Grosset and Dunlap was bound in a subdued green cloth (that tends to fade to an attractive olive on the spine and edges) with plain artwork, but given a binding sturdier than the original edition. 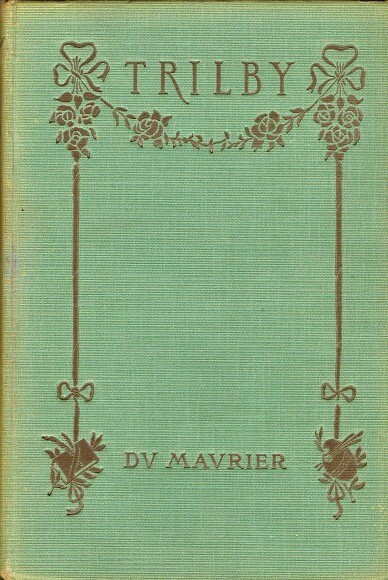 Far different from most photoplay editions, which tend to be inferior quality compared to the original editions. Unfortunately, my photoplay copy does not have a dust jacket, but I’m not sure it was originally issued with one. They weren’t commonly issued with books until the 1910s, and the earliest ones were usually rather plain, without elaborate artwork. 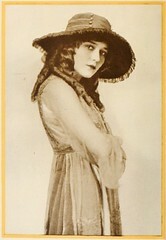 This photoplay edition was published in conjunction with the September, 1915 release of the movie adaptation produced by the World Film Corporation, starring Clara Kimball Young as Trilby, and turn-of-the-century stage superstar Wilton Lackaye as Svengali. Here is the link to the AbeBooks page featuring highlights of some of the best of the photoplay editions on the market.